At a presentation from the Harvard-Smithsonian the BICEP2 team have announced that they have the “first direct evidence of cosmic inflation”. As rimoured they have detected what they believe to be primordial gravitational waves with a ratio or tensor to scalar modes of r=0.2 (+0.07 -0.05) which is 5 sigma over the null hypothesis. This is a game-changing result for inflationary cosmology and possibly for quantum gravity research because the result indicates that the scale of the inflation is only about a factor of 100 below the Planck scale. These results and the future followups that will no doubt be carried out could be the experimental test-bed for the leading edge of theoretical physics including string-theory. The papers are now online but everything is down at the monet due to heavy load. I just managed to get this snapshot of the abstract and a few pictures. More when I have it. This graph is the money plot showing where we now stand in observational inflationary cosmology. 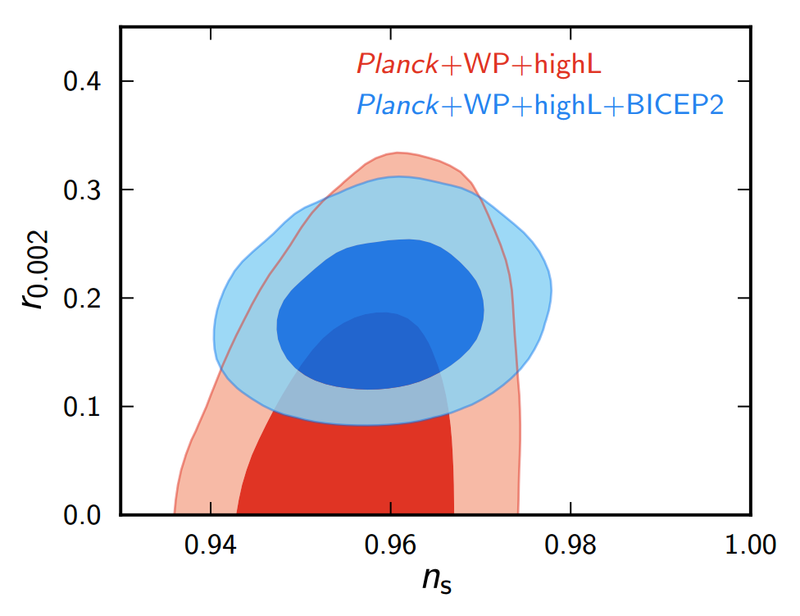 Blue is the new result using BICEP2 compared to previous results from Planck and other sources. Note that Planck should release more polarisation measurements soon. Should have spotted this video yesterday, very moving. The most interesting thing now is going to see how theorists react to these results. They will have implications for inflationary cosmology (obviously), galaxy formation and quantum gravity. To get the ball rolling theorist Liam McAllister has a guest post on Lubos Motl’s Blog with the quote “The tensor fluctuations write quantum gravity on the sky” exciting stuff! This entry was posted on Monday, March 17th, 2014 at 3:11 pm and is filed under Uncategorized. You can follow any responses to this entry through the RSS 2.0 feed. Both comments and pings are currently closed. Generally, I see a large variation of estimates for the time when inflation begins. With these result, can you estimate the time it began? 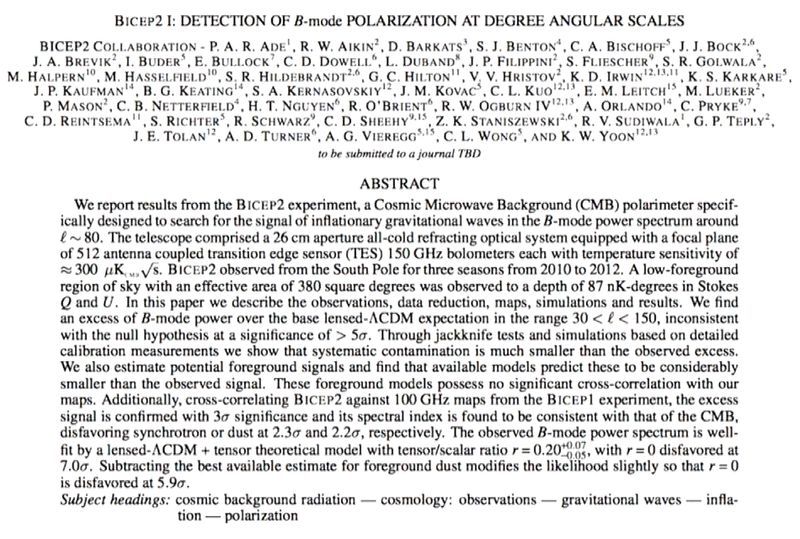 They were surprised to detect a B-mode polarization signal considerably stronger than many cosmologists expected. The team analyzed their data for more than three years in an effort to rule out any errors. They also considered whether dust in our galaxy could produce the observed pattern, but the data suggest this is highly unlikely. “This has been like looking for a needle in a haystack, but instead we found a crowbar,” said co-leader Clem Pryke (University of Minnesota). Proposal for the Origin of Unexpected Large B-Modes Found in the Bicep2 Measurements. One of the papers states “For the model which is perhaps the most likely to be close to reality, the max. likelihood value shifts to r=0.16 with r=0 disfavoured at 5.9 sigma.” – What does this mean? LOL, Carla, if you meant Liam and me, then I surely view it as a compliment but your explanation is unlikely. I am actually not sure at all whether he has ever been a reader. Much of this similarity is an artifact of the visual appearance of the post – sort of pushing him towards the font- and TeX-related conventions etc. although he prefers to vary font size and do similar things, something I have largely abandoned. What about the vast unseen swarms of dim galaxies that show up whenever the telescope is improved? How do we know what is cosmic signal and what is background? That is a question that will be under heavy scrutiny I am sure, but in principle it should be possible to estimate the effects from lensing of galaxies and they are claiming a very clear signal above that background. This must allow for early formation of galaxies as yet unseen. I think an interesting question is whether adding these primordial gravitational waves into the LCDM models could actually help to explain the unexpectedly early formation of galaxies that has been observed. Given that these background galaxies are as yet unobserved and unmodeled, isn’t it a little extreme to claim this as evidence of gravitational waves? It’s evidence within the context of inflation, but that may go out the window when Webb goes into action. People are going to ask me about this, I have to give them a straight answer. What I see is an accurate measurement of the CMB polarization – bravo, but the immediate conclusions seem a little over the top to me. Not to be obtuse, but the part about gravitational waves is not an observation, rather an inference within the context of one model. I must say that I too remain a bit skeptical about the unambiguous interpretation of the data in terms of pure gravitational waves or gravitons. Was the poorly understood distribution of Dark Matter clumps taken somehow into account? How about lensing from distant galaxies and artifacts induced by local concentration of Black Holes or unknown astrophysical sources? These are questions that should be asked, but they are looking at quite a large chunk of sky compared to the scale of gravitational lenses. The amount of matter and dark matter around is well understood so I suspect this possibility is not hard to eliminate. Another question is whether any other plausible theories of the early universe apart from inflation can explain it. The answer is probably not but we can wait and see what anyone comes up with. The big question in my mind is why is there such a large discrepancy between the instability scale of SM (10^11 to 10^12 GeV) and the inflation scale of 10^16 GeV. New physics can likely develop between these two scales, including the formation of super-massive and highly unstable objects whose decay can mimic primordial gravitational waves. Independent confirmation is a must at this point. Until this is going to happen, the observation of primordial gravitational waves ought to be taken with a grain of salt. Let’s wait and see. The recent Sky and Telescope article also claims that these photons are Hawking Radiation as well due to the quantum gravity curvature they decoupled (or emmitted) from. In principle could this be correct? It seems like a very strange interpretation to call it Hawking radiation. I don’t see it like that at all. Here is the link before I accuse myself of dreaming it up. It looks that Max Tegmark maybe saying something alomg this line. Please bear in mind that a very large number of stellar and galactic scale black holes undergoing violent interactions immediately following the Big Bang could also have produced the gravitational waves that billions of years later yielded the B-mode polarization that was observed recently. In science, it is important not to dogmatically insist on one interpretation when other equally valid interpretations are available. Observational evidence will eventually help us to decide the best way to interpret the physics of the B-mode polarization. We are in the very early stages of this exciting new research. Just a technical detail that some people who had read Jester’s pre-announcement notes may be confused by. The Planck-recommended bump in the BICEP2 graph of “n_r vs r” looks taller i.e. more tolerant than the original pre-announcement bump recommended by Planck. It’s because BICEP2 had to consider a more general model with a running (k-dependent) spectral index n_s. With this extra freedom, one gets a substantially better agreement of the model with the data, and also reduces the Planck-BICEP2 discrepancy that would otherwise be 3 sigma or so. Some people, like string gas cosmologist Robert Brandenberger, immediately suggested that this may mean tension for the whole inflation, suggesting string gas cosmology instead. I would like to see more detailed comments from him etc. He is writing a paper which he could also post as a blog. The simple Linde quadratic inflation is doing very well, the same “r” and “n_s”. Due to the Lyth bound, one needs things like monodromy models in string theory or QG – to avoid assumptions that the effective theory is still OK at large changes of the inflaton field. Archil K. proposed that the Higgs potential in pure SM becomes unstable even in practice during inflation – a paper he wrote with someone. There’s also a paper saying that the tensor modes exclude minimal SUGRA due to too strong gravitino productions, but that was probably assuming lighter gravitinos than what seems compatible with the LHC now. that makes the “SM Higgs instability during inflation” a very real cataclysm as soon as the B-modes are found. LOL. He points to his 1991 paper showing that the currently known inflation scale is indeed the GUT scale in SUSY GUT. So certain intriguing themes are likely to return to us in the near future. I am really not sure whether Planck is competitive, and even if “he” is, I am not sure whom I would believe in the case of a disagreement. At any rate, many people have spent much more than half a year with writing about things that don’t exist at all – and that are much more implausible than these waves. Yes perhaps Planck is not competitive. If not there will be other experiments that follow later. Hope that some expert will take it as an inspiration to write a “more authoritative” version of a similar text. Thanks I enjoyed reading that. It does make it look like I was too hasty about the contributions of Linde. His version of inflation appears to be in best shape. Perhaps a little more data and analysis could confirm that he is sufficiently right for the Nobel. I am happy to back-peddle a little on that. Right, the souring of Linde’s versions occurred pre-BICEP, for theoretical reasons, because it seemed to predict the large changes of the inflaton field, and it seems problematic theoretically, and so on. So that’s why even the old inflation stated to look necessary again etc., instead of Linde’s slow-roll general concept. But now we sort of know experimentally that the inflaton field is really changing a lot, and this renders the theoretical complaints almost immaterial because the empirical data rule. For those who have maintained a semblance of scientific objectivity in the rapture over the BICEP2 results, please check out this well-informed warning from Dr. Peter Coles, a theoretical cosmologist who knows the details. Hold your bets, my friends! In my view the warning has its value if scientist relate too easy the B modes or magnetic struture to gravity ripples. An intersting aspect to this is that the results are determined at the 10^16 GeV which is in the area of GUT not far from the Planck energy of 10^19 GeV. This suggests that supersymmetry is still very much in the running but maybe at the hot, dense state. Furthermore, (and speculative of course) is that if it is true that the supersymmetry broke at this level the hierarchal gap of 10^14 possibly introduces a measure of rigidity (but not absolute) for the constants we observe in our Universe. This could mean that the Einstein equivalence principle allows for a measure of stability (rigidity) in the build of our Universe but that it is not absolute. find this matter to be actually something that I believe I might never understand.